This layout has been sitting on my counter for a few days now. I have one of those stands that you can display your layouts on and in an attempt to display some of these projects I've spent so much time on, I've started putting up my latest creations for people to see when they come over. I've actually made more recent pages, but I am seriously in love with this one so much that I just cannot bear to take it down and put it into my album just yet. Love you to the moon and back. I've seen this saying in a million different formats. I think the very first time I saw it, it was a print, and why I didn't buy it, I don't know. Because I could put it everywhere. But alas. This is a post about a layout. Not my love of quotes. It was pretty simple to make, and quite fast too. The quote is a Silhouette vinyl cut from the store. I used the negative and cut it where I wanted it to be on the background. I then backed it with patterned paper, laid down the positive into the negative space so I could get the little inner pieces into the right places. That was about the only tedious part of this layout. I used Mister Huey in Bluegrass for the splatters. 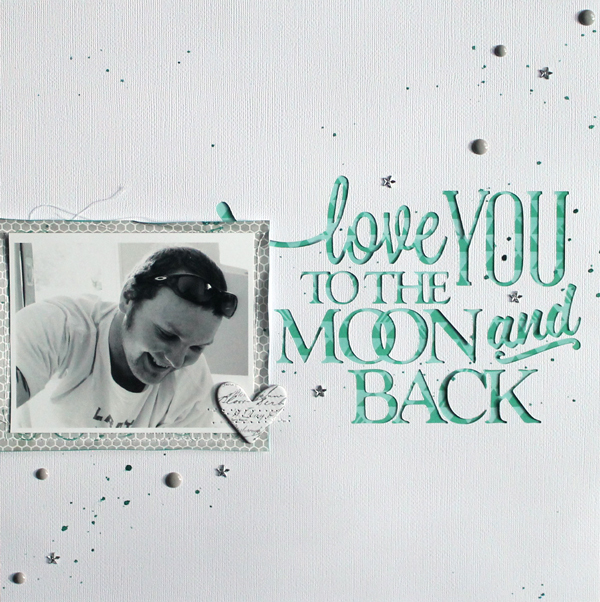 The papers and embellishments are all from Studio Calico's Block Party Kit (along with the add-on Wildberry Court). The photo is matted with a piece of patterned paper from the Card Kit for Block Party and has been sewed around the edges (a detail you cannot really see in the photo I don't think). I also curled the edges of the mat, so there is quite a bit of dimension when you are actually looking at the page in person. I really love the patterned papers in the Card Kit - they're scaled down and are just so sweet in that size. I've had to stop myself from using that honeycomb pattern paper on everything. Seriously - it's just too cute and so neutral it goes with pretty much anything I make! That's about all I've got to say on this one. I'm really working on trying to create more content for this blog. But I'm torn between just showing layouts, or sharing a bit of my day to day life here. I'm normally a pretty sharing person, but I haven't quite figured out just what it is I am okay with sharing yet! Happy Family Day to all those who are sharing in on this holiday - I personally just love the random Alberta Holiday (though I hear there's other provinces who have this too?) and the fact that I am off! And Paul is home! And we're just spending the long weekend hanging out doing whatever. Love it! Love the layout...a lot!! Love the pop of colour on the otherwise neutral page, and I really like how you used those little stars. I haven't even pulled mine out of the little baggie, so maybe this will serve as inspiration. Can't wait to see what you have in store for us next. Fabulous layout! Perfection! Thank you for sharing! This is a gorgeous layout and I can see why you would want to keep it where you can enjoy it. I seriously love the negative text and now I need to go find something to do that on! Awesome job!